Apple started selling its latest version of the iPod touch, nano and shuffle on Wednesday. Apple's iPod touch is now essentially an iPhone 6 without a cell connection. On Wednesday, Apple (AAPL) released its latest version of the iPod touch, giving it better cameras, the same A8 chip as the newest version of the iPhone, and a fresh coat of paint. The new iPod touch's rear camera is now 8 megapixels, up from 5 MP in the previous version. It can now take time-lapse video, pictures in slow motion, burst photos and panoramas. The iPod touch's 1.2 MP front-facing camera is exactly the same as the iPhone 6's. It allows people to adjust exposures, record in 720 HD video, and has a timer mode. Since it runs iOS 8, iPod touch customers can access Apple Music, the company's new streaming music service. 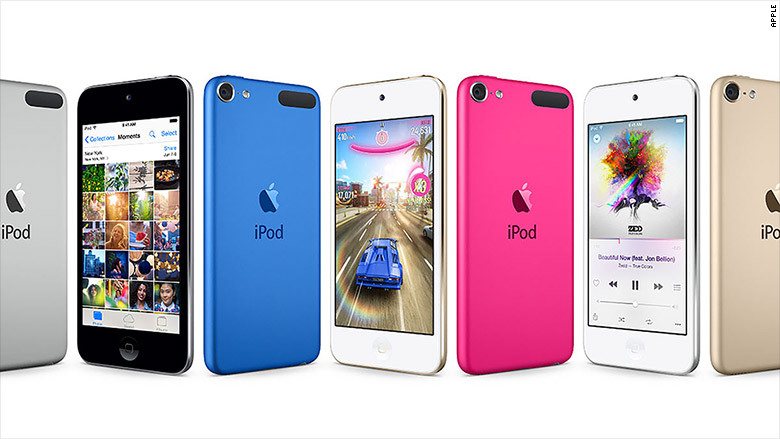 Apple also gave all of its iPods new colors -- blue, pink, silver, gold and space gray. The iPod nano and iPod shuffle also have the new colors, but no hardware or software changes. Wednesday marks the first set of major upgrades to the iPod since October 2012. The iPod hasn't been a major contributor to Apple's bottom line in years, but the iPod label still holds a lot of brand value for the company. The new iPods are on sale online and in Apple Stores now. Prices for the iPod touch begin at $199 for a 16 GB model and swings up to $399 for a 128GB version -- the largest storage capacity ever for an iPod touch.